Deontay and his mom, Therese Hankey. Deontay Hankey remembers the first time he bought a stock as if it happened yesterday. He was in sixth grade at Hamilton Elementary/Middle School in Baltimore City. From a computer in his classroom and under the supervision of his teacher, Deontay snapped up shares of Ford Motor Co., Coca Cola Company and SiriusXM as part of his Stocks in the Future class. 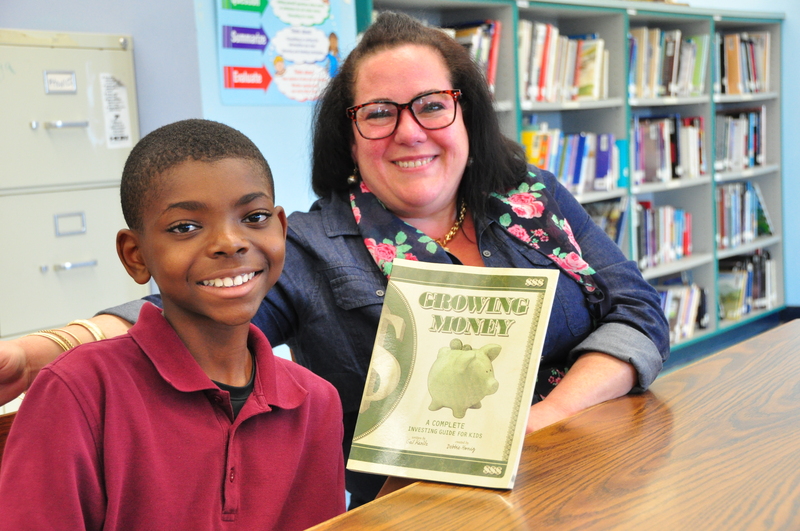 The incentive-based curriculum designed by Johns Hopkins University encourages middle school students to stay in school by teaching them about finances, business, mutual funds and stocks with a cash incentive for good attendance and grades. As Stocks in the Future dollars build they are converted to real money and invested in the market. With a broad smile and eyes that flash brightly, Deontay admits that he was excited but nervous. Deontay began studying the stock market last year when he and his classmates learned about the forces that make it move up and down. They studied vocabulary and inflation, the jobs of brokers and traders and the difference between depreciation and appreciation. He is ready to dive deeper this year with his seventh grade math teacher, Ms. Regina Schmidt. Deontay’s mother, Therese Hankey, said her 12-year-old son talks about investing even when he is at home. Deontay has big plans. After middle school, he hopes to attend Baltimore Polytechnic Institute and then Johns Hopkins University. After a career as a professional athlete, Deontay plans to become a physician and then a lawyer. He and his mom laugh because they figure he will be in his 80s by the time he becomes a lawyer. What stocks is he looking to buy this school year? He likes Electronic Arts Inc., a video game maker that has hits like Madden NFL, FIFA and NBA Live. So, Deontay continues to be excited about investing. With his determination and intelligence there is no doubt he will find plenty of interesting companies to invest his hard earned Stocks in the Future dollars in. Don’t be fooled by Bethany’s disarming smile and shy demeanor. 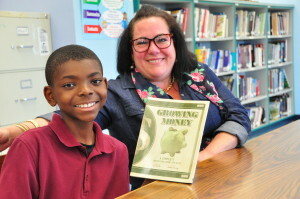 When it comes to making the right investments this 13-year old is all business and could one of the best young stock and mutual fund investors in Baltimore City. As an eighth grader at Hampden Elementary/Middle School Bethany and her team beat out nearly 30 classmates in May in the Stocks in the Future Capstone Project, which was designed by Baltimore-based mutual fund giant T. Rowe Price Group Inc. specifically for the students. With $100,000 in make believe money Bethany and her team designed a mutual fund of 173 stocks that grew 6.8 percent in just four weeks to $106,877. Her closest competition was a full 2.5 percentage points behind. 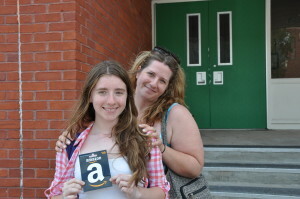 Bethany and her mom, Amanda, at Hampden EMS. The same month, she competed against 230 eighth graders at the Stocks in the Future 8th Grade Rally at the Enoch Pratt Free Library in Baltimore City taking first place and a $100 prize after putting together the highest performing portfolio. Bethany’s mother, Amanda, says her daughter has a gift when it comes to picking stocks and understanding how mutual funds work. It is not unusual to see the two sitting shoulder to shoulder at the counter in Café Hon pouring over Amanda’s 401(k) statement. What has been Bethany’s secret to success? “I researched a lot of the companies I invested in,” says Bethany, who considers herself a moderate risk taker. Bethany and Amanda talk mutual funds with SIF Board member Bill Atkinson. Stocks in the Future opened up a new world for Bethany. The curriculum, designed by Johns Hopkins University to encourage middle school students to stay in school by teaching them about finances, business, mutual funds and stocks with a cash incentive for good attendance and grades, wasn’t always easy for Bethany when she started the coursework in sixth grade. But after awhile the numbers and concepts became easier to grasp and like investment guru Peter Lynch, she embraced the idea of investing in companies she knew, such as Facebook and NutriSystem Inc., and enjoyed watching her money grow. “I liked how you can start with a little bit of money and build it,” says Bethany, whose favorite stocks include Coca-Cola Co., Amazon.com and Sony. These days the language of Wall Street rolls off of her tongue. She tosses out words and phrases like “ticker,” “free cash flow,” “diversification” and “profit margin,” while Amanda smiles and nods her head in approval. Amanda sees a competitive drive in her quiet daughter. She noted that Bethany won the school spelling bee and the science fair. “She is used to winning all of the time,” Amanda says. She isn’t the only one impressed with Bethany’s success. 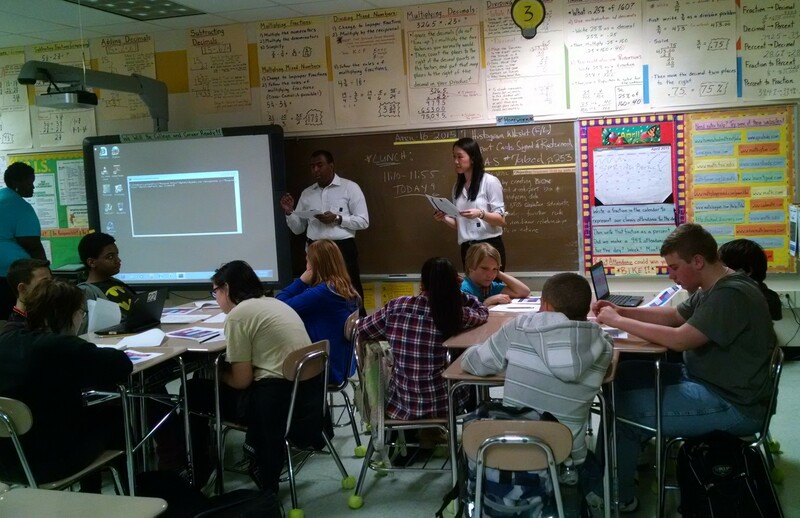 T. Rowe Price fellows introduce SIF’s Capstone Project to Bethany and her Hampden EMS classmates, April 2015. 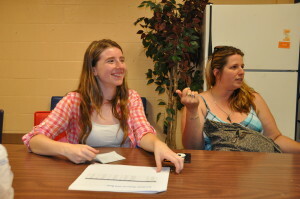 Bethany plans to keep her hand in investing when she attends high school in the fall. Under Stocks in the Future’s rules she will be able to buy and sell stocks and mutual funds at certain times during the year. In the fall, Bethany plans to attend Baltimore Polytechnic Institute, a highly competitive college preparatory high school in Baltimore City, and hopes to be a math teacher although she has signed up for at least one engineering course. Some believe that past success is a good indication of future success. If that is true, Bethany should perform even better than one of her winning investment portfolios.